During Modi’s rule, the price of oil imported by India fell by 32% yet central taxes were hiked by 129%. The BJP government at the Centre, led by Prime Minister Narendra Modi, who likes to refer to himself as the pradhan sevak, is brazenly trying to fool the people of the country on the issue of petrol and diesel prices. 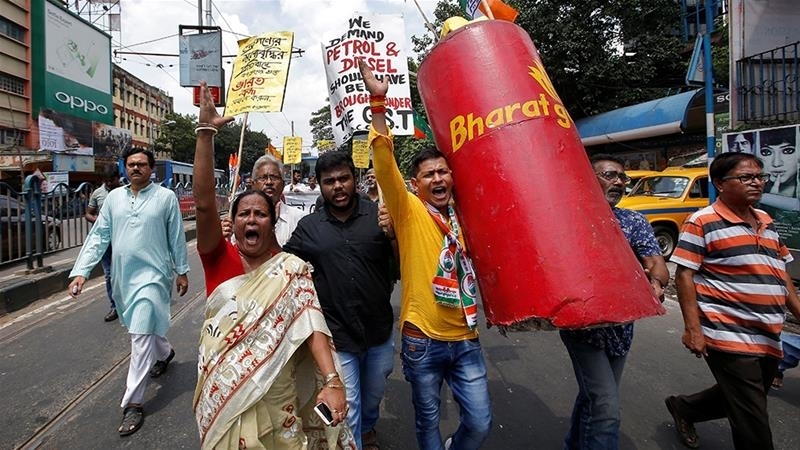 After the Bharat Bandh of September 10, called by 21 Opposition parties that saw widespread support across the country, one central minister came out with the spurious argument that fuel prices in India are rising because international crude prices are rising. But the truth is something else. For three years straight after the Modi government took over power in May 2014, the price of crude oil in the Indian basket fell from $109.05 per barrel in June 2014 to $46.56 per barrel in June 2017. After that, it has risen to end up at $73.83 per barrel in June 2018. This is according to official data put out by the Petroleum Planning & Analysis Cell (PPAC) under the Ministry of Petroleum and Natural Gas. So, in four years, the price has actually dipped by about 32% since the Modi government took over. The Indian basket is a mix of two types of crude oil that India imports. But there is more. The colossal deception that the Modi government’s spin-masters are trying to peddle is further exposed by the fact that international crude oil prices have little to do with what the Indian consumer pays. It is the taxes that are killing people. About 46% of what the common consumer pays for petrol is made up of taxes charged by both, the Central as well as the state governments. As shown in the charts, in 2014-15, the Modi government was making some Rs.1,22,200 crore out of taxes that it levied on oil. By 2017-18, this has zoomed up to Rs.2,80,000 crore! That is an increase of a staggering 129%. According to some estimates, the Central government has collected over Rs.11 lakh crore worth of taxes in this period riding on this bonanza. The ruling BJP has also been propagating the myth that it is state governments that are actually responsible for the rising prices of oil. There has been a 32% increase in state taxes during the past four years. But all the states put together collect some Rs.1,86,000 crore in taxes on fuel compared with the Centre’s cut of Rs.2,80,000 crore. And, in any case, the BJP is ruling in 21 states, as their leaders never tire of reminding us. Only recently has one of its state governments – in Rajasthan – reduced the state tax, because it is facing a tough Assembly election in a few months. Another deception that the central BJP govt. is attempting to propagate is that higher tax revenues are good for the states and the people because all the money collected in the tax kitty goes for the benefit of the people. It is also argued that central tax collections are shared with states and so, higher tax earnings will benefit state govts. This would be true if the BJP government was actually spending money for the benefit of the people. But, in fact, there have been cutbacks in almost all central welfare schemes over the years of Modi rule with paucity of resources being cited as the reason. So, the Centre doesn’t seem to be redirecting the money earned from oil taxes to any public good. On the other side, corporate houses have been indiscriminately given loans which they are now refusing to return. Such bad loans – given from public money collected through taxes – have reached over Rs.10 lakh crore, as per Reserve Bank of India. There are many such cases of corporate houses and cronies of the government/ruling party being given massive handouts from the public exchequer. In fact, the government has been selling off national assets, like the public sector units, to private entities. The Modi government can hardly be said to have used tax revenues for the people in any fair or inclusive manner. WATCH: "No Rational Basis for Fuel Price Hike"
What the sordid saga of oil prices shows is that the Modi government has actually been extorting money from farmers, workers and other common people of the country in order to satisfy the greedy appetites of corporate houses and big landowners. Oil and its products (petrol, diesel, kerosene, etc.) are used not just by the rich or middle classes. It is essential for irrigation, for transport of agricultural commodities and finished goods and for cooking fuels. Increasing prices directly as well as indirectly (through price rise of other commodities) rob the people of their hard-earned money. No amount of lies by BJP will assuage the anger felt by the people at this daylight robbery.